I have always loved surfing (although I am a high handicapper at it) and thought it was a fantastic escape from golf. Until today that is, as surfing a wave just brought the golf swing into a brand-new perspective. When you are out waiting for that perfect wave, everything is calm, peaceful and relaxing. Then, all of a sudden you start to feel the energy from the ocean beneath you. You turn to start slowly paddling to catch the wave, but instead the wave is actually going to let you ride it. As you paddle, you feel the energy building beneath you and it actually slowly pulls you back and up into the wave. This energy builds as you are pulled gently back and it almost pauses for a moment. This is when you pop up, in this little pause as momentum shifts from pulling you back to slightly moving you forward. You are then part of this beautiful energy as it propels you forward, slow at the beginning and then increasing your speed as you accelerate smoothly down the face and are balanced, acting at one with this energy and being moved forward and along for a magical ride. Now, how does this relate to golf? Well the best players are always moving a little at set up, they have taken their stance and may waggle or forward press and as they feel the energy from the ground up, like the wave, their club is slowly pulled back. Most struggling golfers are looking for a trigger or want to jerk the club back, instead of feeling or sensing the energy and letting the club simply move back with this flow of energy. Then in most great swings, there is almost a little pause from the backswing before the forward swing begins, exactly as in surfing. The energy transforms from moving the club back and up to again from the ground up moving the player in the direction towards the target. The move is initiated from the ground up and the club smoothly accelerates almost in the shape of a wave through the ball and effortlessly to a full balanced finish. The best golf swings simply use the energy and build it back and then let it accelerate the club through the ball to a full balanced finish. 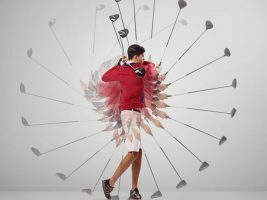 Whereas most golfers are trying to move the club back and then thrust it forward at the ball, trying to create the energy themselves instead of feeling the energy and becoming a part of it. I truly believe that this energy is all around us at every moment. In golf and in life, we have to recognize this energy and be willing to accept it and feed off of it. It is not some mystical thought but a reality. The greatest in their respected fields, be it business, sports, music or art, harness this energy and ride the wave to the outcome. We all hear that if we truly want something the Universe conspires to give it to us. This is not achieved by just wanting, but by sending energy out and then be willing to use the energy sent back to you in a positive way. In golf, this is where true balance, finesse and power resides. See you in the fairway in Thailand.